Quite a few companies in Qatar have already recognized the importance of shared value and corporate social responsibility. A few that stand out are Vodafone, and Qatar Airways – both have embarked on important efforts to create the intersection between society and corporate performance. Against the backdrop of building local ecosystems, crowdsourcing, efficient supply chain management, and the age of consumer participation, it is fair to say that technology and open innovation can help companies redefine productivity in the value chain and embark on more responsible business practices. We all agree that disruptive changes in climate, pollution, and global urbanization are already occurring, but there is a lack of common and transparent data that we, as a global society, share. It seems like there are a lot of institutions around the world that independently acquire and compile critical data, but I am not that certain that this information doesn’t exist in silos. Wayne Wisser in his book “The Age of Responsibility. 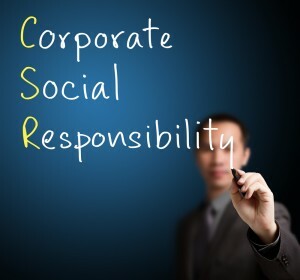 CSR 2.0 and the New DNA of Business” compares a transformational journey of CSR to that of Web 2.0. We are shifting from the old concept of CSR – the classic definition of philanthropic movement mixed with some PR and reputation management to CSR 2.0 – a sustainable management framework that is defined by the “global commons”, open data, and diverse stakeholder networks. CSR experienced a shift from being purely local to globally oriented. And is there a platform for locally rooted, yet global ecosystems better than social media? Social media is a gift for reputation management and creating networks and ecosystems alike – empowering people by inviting the like-minded to come together and share ideas, best practices, and insights. Besides the usual suspects – Facebook, Twitter and LinkedIn, the online platforms that specifically address sustainable business issues are Development Crossing and Justmeans. The latter helps consumers and stakeholders differentiate one business’s CSR performance versus another and provide information and connections with over 250,000 movers and shakers. Development Crossing is a smaller platform with about 10,000 users where people basically exchange sustainability related information. I wasn’t impressed by the quality of the content. A case in point is a recent post by an AT&T employee that describes the company’s CSR achievements. I would have found it more useful if the post addressed “how they did it” versus “what they did”. Without the “why” it sounded like a perfect marketing spiel, and the rest of the stories seem to have the same flavor. For those companies that want a bit more control over the public facing messages, there is also OpenEyeWorld, a tool that claims to eliminate the logistical and cost barriers associated with traditional stakeholder engagement, and offers the control and security that social media platforms don’t have. In essence, it’s an expert database that facilitates exchanges between businesses and CSR practitioners. This platform seems to be addressing the “how” of common sustainability issues and has an attractive capability to provide a user generated ratings for the expert crowd. The technology examples above show that technology is playing as important of a role as policy makers and NGOs in shaping a sustainable growth ecosystem and that data is really a public domain that many can benefit from. Julia Astashkina is heading the Marketing and Outreach Section at the Ministry of Information and Communication Technology in Qatar. She runs organization’s multiple communications and marketing initiatives and is a guest blogger of the Digital Qatar blog. Julia has extensive experience in strategic marketing, communications, and social innovation. She has an MBA and other degrees from Georgetown and ESADE, and is the community lead for Creative Commons Qatar.